Dare we say this new electric bike is shockingly good? HAS KTM manufactured any bad bikes in the last 10 years? I can’t think of a single one. The RC8 didn’t do particularly well in comparison tests but it was a great road bike. So was the 990 SM even if sales numbers were low, shadowed by the more popular SMT and SMR of the same era. The 660 SMC required several months of training to perfect the kickstart technique - once running though, was a raw and exciting motorcycle. I could probably go on forever. So surely it must be about time that something naff came out of the Mattighofen Factory - other manufacturers have all released flops, surely it’s the turn of the Austrians. Apparently not. I've just ridden their new electric off-road bike and it was brilliant. 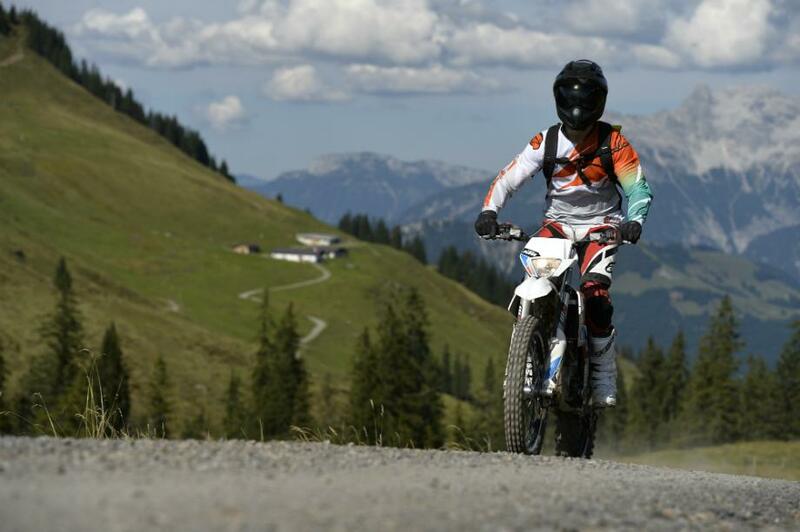 On paper, the Freeride E probably looks like all sorts of wrongness to most bikers. Electric motor, no noise, no real powerband, it’s like motorcycle blasphemy of the highest order. Except it’s not. Give it a chance and it actually begins to make a lot of sense. 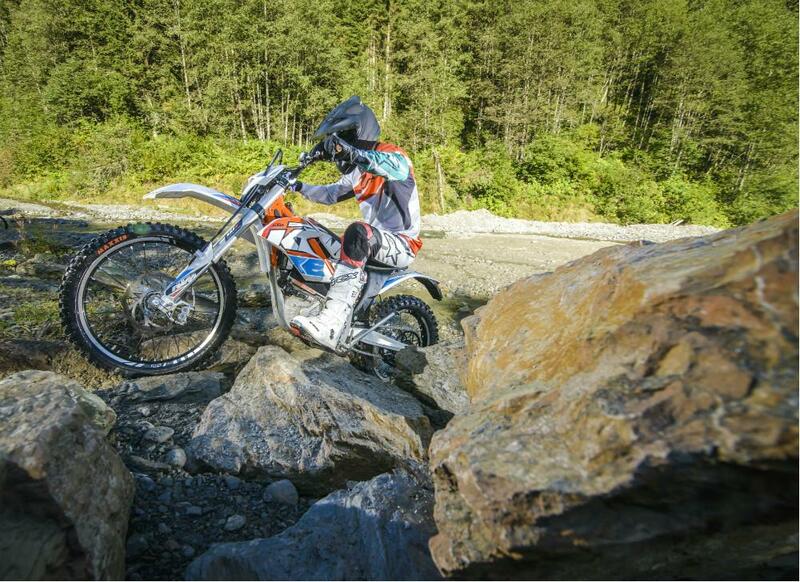 Cradled in the same frame used by the petrol-powered Freeride 250 and 350 is an electric motor putting out 22hp. With 31ft.lb of torque from 0rpm, you have the same amount of poke as a Honda CBR500R, which uses a 471cc parallel-twin and requires an A2 licence to ride. However, because of the complexities of EU tests, the Freeride E has managed to get a 'rated' power figure of 15hp, which means it's legally no different to a 125, and can be ridden by learners or those with a full A1 licence. The E has shorter gearing than its petrol-powered sibling too, and a much lower 110kg wet weight, all of which results in a bike that reaches its 50mph top speed remarkably quickly. Everything on the bike is powered by a 2,600Wh lithium-ion battery, secured underneath the quick-release seat by four bolts. It stores 360 cells and at 28kg is surprisingly hefty; similar in size to a large car battery it rules out carrying a spare one in your backpack to extend range. During a press conference at the International launch, KTM press manager Thomas Kuttruf said in the hands of an experienced rider constantly on the limit, the E would last about 30 minutes, maintaining consistent performance until it runs out of juice. For almost anyone else, you’re looking at about an hour of usage before a recharge is on the cards. I think the Freeride E was undersold in that respect - after over an hour of riding steep uphill paths, technical forest sections and open fire trails where throttle was used in abudance, the battery gauge showed I still had three out of five bars of charge left. Charging times are good too. Assuming the battery is at 0%, 50 minutes plugged into a normal 13A socket will give you 80% charge. A full charge takes only 80 minutes. That’s quick, especially when you consider the £15,350 Brammo Empulse R will only last about 60 miles before needing a three-and-a-half hour hook-up. Still, I couldn’t help but squirm when I found out the price of each battery pack: £2,900 per unit and a further £700 for the charger. I overheard a few people saying you could easily swap a flat battery with a fresh one in less time than it takes to refuel your bike the conventional way. Perhaps, but who has almost £3,000 to spend on an extra battery? A full charge only costs about 60 pence. I'm not about to get the calculator out but I'm willing to bet you'll need to cover some serious miles to make the E a cheaper investment than the 250 and 350 models. Starting the bike is a familiar affair. Turn the key, thumb the starter and you’re good to go. There’s a smart-looking, colourful dash located between the seat and the triple clamp, showing you battery charge levels and power modes. You have a choice of Economy, Standard and Advanced. Economy softens off power delivery whilst Advanced gives you a much more direct response. Standard sits somewhere between the two. I opted to stay in Advanced mode for most of the day. The throttle is easier to manage, helping you more accurately launch the bike out of corners on the power. Suspension duties are carried out by 43mm WP forks at the front and a WP shock with progressive damping at the rear - both are fully adjustable. None of the riders, from novice to professional, felt the need to adjust anything all day. Towards the end of the afternoon we veered off a gravel road and down into a tight mountain bike track that highlighted just how technical you can be with the E. Even with 28kgs of battery mounted high-up in the bike’s frame, the Freeride is no slouch during side-to-side transitions. 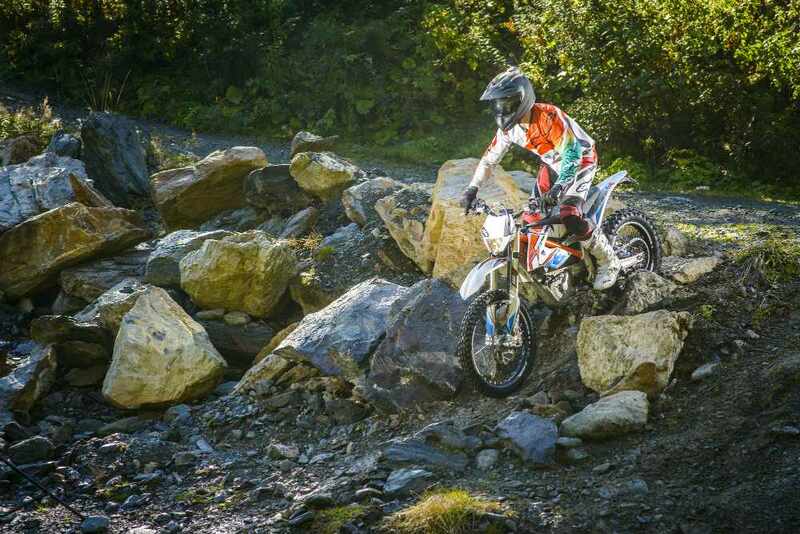 KTM opted for Maxxis tyres, an enduro one at the rear and a trials one at the front to provide adequate grip on both trails and tarmac. Even steep downhill sections littered with sizeable rocks and slippery roots didn’t phase the E, with plenty of grip provided by the 21” front and 18” back wheel. It seemed no matter what surface we rode on, the E was confidence-inspiring and above all, a lot of fun. Before the launch I thought I’d be craving for more power but it never ended up crossing my mind. Acceleration is swift, and even with no clutch or gearbox you can pop a wheelie at most speeds below 20mph with a helpful yank on the bars. Also, with no transmission to worry about, and the rear brake mounted in place of the clutch lever, it makes the whole off-road prospect much more manageable for novice dirt riders. Less controls, less to think about. With ABS included as standard on almost every model in the KTM range I was slightly disappointed to not see a disengageable option on the Freeride E. The radially-mounted brakes offer a good level of feedback and enough bite for stoppies galore. The rear faded slightly towards the end of a 10-minute downhill run but was remedied by adjusting the lever for more travel. Being able to hear rocks crumble away beneath you is slightly unnerving but the quiet, stealthy nature of the E makes riding so much more socially acceptable. I lost track of how many intrigued hikers and cyclists smiled as we rode past on the same track. Being considerate seems to go a long way. We even rode past some cows at 30mph and they didn’t flinch. Try that on a 125 two-stroke. Possibly the biggest issue concerning all electric bikes though, and not just the Freeride E, is the price. 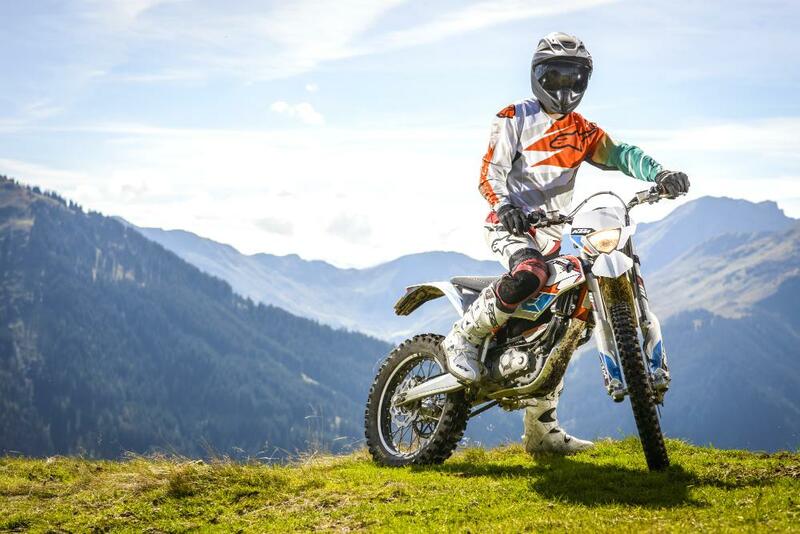 Two identical Freeride E models will be coming to the UK in January 2015, the E-SX, built purely for off-road purposes and the E-XC, the road-legal version. They cost £9,999 and £10,299 respectively. That’s a lot of extra money when a Freeride 250 will carry out a very similar job for over £4,000 cheaper. Perhaps there's hope of them becoming more affordable. 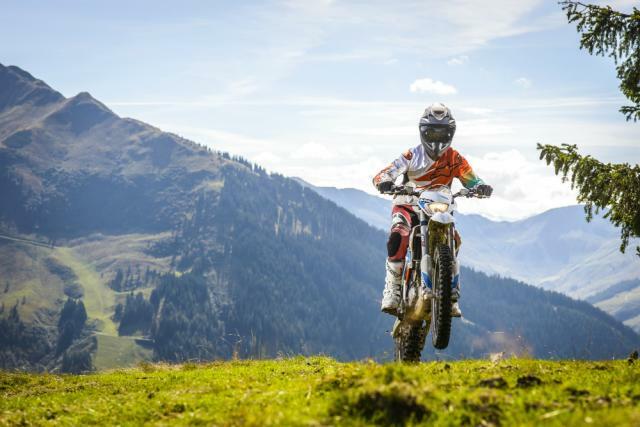 For the last four years drivers have been eligible for a £5,000 government-backed subsidy on the full purchase price of a new electric car, and KTM is lobbying for a similar subsidy on electric motorcycles. Hang in there, KTM. The Freeride E is capable, fun and unique, so it will be a shame if few riders can afford one.